Numerous scientific studies link consumption of Allium vegetables - garlic, onion, chives, leek, etc. - to lower risks of many threats to our well-being. A huge family of sulphur compounds is largely responsible for the pungent smell and benefits of Allium vegetables. GNLD’s Garlic Allium Complex is a state-of-the-art, whole-food supplement delivering standardized amounts of allicin, the key sulphur compound in garlic, plus other beneficial Allium nutrients. Our Targeted Delivery Technology insures that bioactive allicin reaches the intestines, where it delivers optimal benefit. Why garlic and other allium vegetables? Allium vegetables (garlic, onion, chives, leek, etc.) have been used worldwide for thousands of years as foods, spices and folk medicines. Scientific studies show that Allium vegetables are enormously beneficial to our well-being. 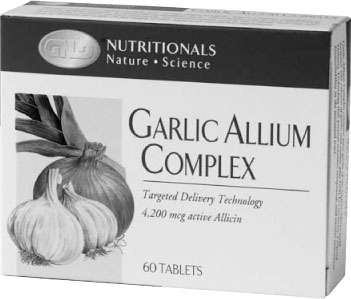 Why GNLD Garlic Allium Complex? Unique process to protect natural enzymes. The enzyme allinase is required for the formation of allicin, the critical sulphur compound responsible for many of garlic’s benefits. GNLD’s special technology protects allinase from destruction by stomach acid. Guaranteed allicin content. Two tablets provide 4.2 milligrams of active allicin from high-yield garlic extracts. Research studies show that this amount - equivalent to that found in one clove of fresh garlic - is effective in promoting well-being. Nutrient family approach. Includes not only allicin, but also other bioactive compounds (for example, oil-soluble substances from fresh garlic and onion), which exist naturally in Allium vegetables and work together in different ways to benefit overall well-being. Targeted Delivery Technology. Enteric coating maximizes the product’s stability and absorption and assures the formation of active allicin in the intestines. As a result, Garlic Allium Complex does not cause repeating or garlic breath! Contains rosemary, a potent, antioxidant herb which helps protect the tablet contents. Convenient. Provides an easy way to reap the benefits of Allium vegetables without having to eat a fresh clove of raw garlic every day.